Portrait of Michel de Montaigne by Daniel Dumonstier. The modern Plutarch and the first of the essayists deserves his place in this work, if not so much for express and explicit denunciation, totidem verbis, of the barbarism of the Slaughter-House at least for a sort of argument which logically and necessarily arrives at the same conclusion. In truth, if he had not "seen and approved the better way" (even though, with too many others, he may not have had the courage of his convictions), he would be no true disciple of the great humanitarian. It is necessary to remember that the "perfect day" was not yet come; that a few rays only here and there enlightened the thick darkness of barbarism; that, in fine, not even yet, with the light of truth shining full upon us, have reason and conscience triumphed, as regards the mass of the community, either in this country or elsewhere. 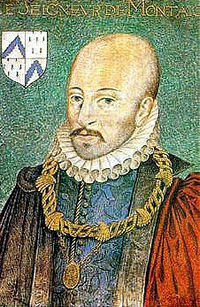 Michel de Montaigne descended from an old an influential house in Périgord (modern Périgeaux, in the department of the Dordogne). His youth was carefully trained, and his early inclination to learning fostered under his father's diligent superintendence. He became a member of the provincial parliament, and, by the universal suffrage of his fellow-citizens, was elected chief magistrate of Bordeaux, from the official routine of whose duties he soon retired to the more congenial atmosphere of study and philosophic reflection. In his château, at Montaigne, his studious tranquility was violently interrupted by the savage contests then raging between the opposing factions of Catholics and Hugenots, from both of whom he received ill-treatment and loss. To add to his troubles, the plague, which appeared in Guienne in 1586, broke up his household and compelled him, with his family, to abandon his home. Together they wandered through the country, exposed to the various dangers of a civil was; and he afterwards for some time settled in Paris. He had also travelled in Italy. Montaigne returned to his home when the disturbances and atrocities had somewhat subsided, and there he died with the philosophic calmness with which he had lived. The Essais - that book of "good faith," "without study and artifice," as its author calls it - appeared in the year 1580. It is a book unique in modern literature, and the only other production to which it may be compared is the Moralia of Plutarch. "It is not a book we are reading, but a conversation to which we are listening." "It is," as another French critic observes, "less a book than a journal divided into chapters, which follow one another without connexion, which bear each a title without much regard to the fulfilment of their promise." Montaigne treats of almost every phase of human thought and action; and upon every subject he has something original and worth saying. Living in a savagely sectarian and persecuting age, he kept himself aloof and independent of either of the two contending theological sections, and contents himself with the rôle of a sceptical spectator. it must be admitted that he is not always satisfactory in this character, since he sometimes seems to give forth an "uncertain sound." Considering the age, however, his assertion of the proper authority of Reason deserves our respectful admiration, and is in pleasing contrast with the attitude of most of his contemporaries. A few, like his friend De Thou, or the Italian Giordano Bruno - the latter of whom, indeed, had more of the martyr-spirit than Montaigne - contributed to keep alight the torch of Truth and Reason. But we have only to recollect that it was the age par exellence of Diabolism in Catholic and Protestant theology alike, and of all the horrible superstitions and frightful tortures, both bodily and mental, of which the universal belief in the Devil's actual reign on earth was the fruitful cause. About the very time of the appearance of the Essais, one of the most learned men of the period, the lawyer Jean Bodin published a work which he called the Démonmanie des Sorciers (the Diabolic Inspiration of Witches"), in which he protested his unwavering faith in the most monstrous beliefs of the creed, and vehemently called upon the judges, ecclesiastical and civil, to punish the reputed criminals (accused of an impossible crime) with the severest tortures. We have only to recognise this fact alone (the most astounding of all the astounding facts and phases in the history of Superstition) to do full justice to the reason and courage of this small band of protestors. this has always appeared to me a very displeasing spectacle. I seldom, or never, take an animal alive whom I do not restore to the fields. Pythagoras was in the habit of buying their victims from the fowlers and fishermen for the same purpose. "Dispositions sanguinary in regard to other animals testify a natural inclination to cruelty towards their own kind. After they had accustomed themselves at Rome to the spectacle of the murders [meurtres] of other animals, they proceeded to those of men and gladiators. Nature has, I fear, herself attached some instinct of inhumanity to man's disposition. No one derives any amusement from seeing other animals enjoy themselves and caressing one another; and no -one fails to take pleasure with seeing them torn to pieces and dismembered. That I may not [he is cautious enough to add] be ridiculed for this sympathy which I have for them, even theology enjoins some respect for them, (3) and considering that one and the same Master has lodged us in this palatial world for his service, and that they are, as we, members of his family, it is right that it should enjoin some respect and affection toward them. "When I meet, amongst the more moderate opinions, arguments which go to prove our close resemblance to other animals, and how much they share in our greatest privileges, and with how much probability they are compared to us, of a truth I abate much from our common presumption, and willingly abdicate that imaginary royalty which they assign us over other beings." "Let him shew me, by the most skilful argument, upon what foundations he has built these excessive prerogatives which he supposes himself to have over other existences. Who has persuaded him that that admirable impulse of the celestial vault, the eternal brightness of those Lights rolling so majestically over our head, the tremendous motions of that infinite sea of Globes, were established and have continued so many ages for his advantage and for his service. Is it possible to imagine anything so ridiculous as that this pitiful [chétive], miserable creature, who is not even master of himself, exposed to injuries of every kind, should call itself master and lord of this universe, of which, so far from being lord of it, he knows but the smallest part? Who has given him this sealed charter? Let him shew us the 'letters patent' of this grand commission. Have they been [octroyées] in favour of the wise only? They affect but the few in that case. The fools and the wicked - are they worthy of so extraordinary a favour, and being the worst part of the world [le pire pièce du monde], do they deserve to be preferred to all the rest? Shall we believe all this? "Presumption is our natural and original disease. The most calamitous and fragile of all creatures is man, and yet the most arrogant. (5) It is through the vanity of this same imagination that he equals himself to a god, that he attributes to himself divine conditions, that he picks out and separates himself from the crowd of other creatures, curtails the just shares of other animals his brethren [confrères] and companions, and assigns to them such portions of faculties and forces as seems to him good. How does he know, by the effort of his intelligence, the interior and secret movements and impulses of other animals? By what comparison, between them and us does he infer the stupidity [la bétise] which he attributes to them? "Plato, in his picture of the 'Golden Age', reckons amongst the chief advantages of the men of that time the communication they had with other animals, by investigating and instructing themselves in whose nature they learned their true qualities and the differences between them, by which they acquired a very perfect knowledge and intelligence, and thus made their lives more happy than we can make ours. Is there a better test by which to judge of human folly in regard to other species? "I have said all this in order to bring us back and unite ourselves to the crowd [presse]. We are [in the accidents of mortality] neither above nor below the rest. 'All who are under the sky,' says the Jewish sage, 'experience a like law and fate.' There is some difference, there are orders and degrees, but they are under the aspect of one and the same nature. Man must be constrained and ranged within the barriers of this police [Il faut contraindre l'homme, et le ranger dans les barrières de cette police]. The wretch has no right to encroach [d'enjamber] beyond these. ; he is fettered, entangled he is subjected to like necessities with other creatures of his order, and in a very mean condition without any true and essential prerogative and pre-exellence. That which he confers upon himself in his own opinion and fancy has neither cause nor substance; and if it be conceded to him that he alone of all animals has that freedom of imagination and that irregularity of thought representing to him what he is, what he is not, and what he wants, the false and the true, it is an advantage which has been very dearly sold to him, and of which he has very little to boast, for from that springs the principal source of the evils which oppress him - crime, disease, irresolution, trouble, despair." "With plaintive cries, all covered with blood, and in attitude of a suppliant." See the story of the death of Sylvia's deer (Æneis, viii.) - the most touching episode in the whole epic of Virgil. The affection of the Tuscan girl for her favourite, her anxious care of her, and the deep indignation excited amongst her people by the murder of the deer by the son of Æneas and his intruding followers - the cause of the war that ensued - are depicted with rare grace and feeling. "It was in the slaughter, in the primeval times, of wild beasts (I suppose) the knife first was stained with the warm life-blood." See Ovid Metam. xv. Christian theology, to which doubtless Montaigne here refers, the force of truth compels us to note, has always uttered a very "uncertain sound" in regard to the rights and even to the frightful sufferings of the non-human species. Excepting indeed, two or three isolated passages in the Jewish and Christian sacred Scriptures which, according to the theologians, bear a somewhat equivocal meaning, it is not easy to discover what particular theological or ecclesiastical maxims Montaigne could adduce. We use the term in deference to universal custom, although Francis Bacon protested 250 years ago that "Antiquity, as we call it, is the young state of the world; for those times are ancient when the world is ancient, and not those whose we vulgarly account ancient by computing backwards - so that the present time is the real Antiquity." Advancement of Learning, I. See also Novum Organum. Plays such fantastic tricks before high heaven," &c.
. . . . . . . . . . . . . . . . . . . . . . . . . . . . . . . Measure for Measure. With these just and common-sense arguments of Montaigne compare the remarkable treatise (remarkable both by the profession and by the age of the author) of Hieronymous or Jerome Rorarius, published under the title - "That the [so-called] irrational animals often make use of reason better than men." (Quod Animalia Bruta Sœpe Utantur Ratione Melius Homine.) It was given to the world by the celebrated physician, Gabriel Nandé, in 1648, one hundred years after it was written, and, as pointed out by Lange, "by its severe and serious tone, and by the assiduous emphasising of just such traits of the lower animals as are most generally denied to them, as being products of the higher faculties of the soul. With their virtues the vices of men are set in sharp contrast. We can therefore understand that the MS., although written by a priest, who was friend both of Pope and Emperor, had to wait so long for publication." (Hist. of Materialism. Vol. i., 225. Eng. Trans) It is noteworthy that the title, as well as the arguments of the book of Rorarius reveals its original inspiration - the Essay of Plutarch. Equally heterodox upon this subject is the De La Sagesse of Montaigne's friend, Pierre Charron.